Easily Spain's most famous architect is Antoni Gaudi. Barcelona's international reputation wouldn't be the same without the work of Gaudi. Barcelona's most famous landmark, La Sagrada Familia was designed by Gaudi, as were Park Guell and La Pedrera and Casa Batlló. Born in Catalonia (the exact town is disputed), Gaudi's work has had a lasting impression on Barcelona with his Art Nouveau architecture. Even people with no previous love of architecture place visiting Gaudi's buildings in Barcelona at the top of their list of things to do in in the Catalan capital. This Gaudi trail starts at Placa Real just off Las Ramblas. It then goes up Passeig de Gracia, taking in Casa Batllo and La Pedrera before veering off to the east to La Sagrada Familia. It ends at Parc Guell. Not the most exciting of Gaudi's achievements, but Plaça Reial (this is the Catalan name for it; in Spanish it is Plaza Real) should be an essential part of your tour of Barcelona—so it's a good place to kick things off. Walking up Las Ramblas from the sea front, Plaça Reial can be found through an alleyway on your right hand side, about one third of the way up Barcelona's most famous street. Gaudi's influence on this palm tree-lined plaza extends no further than the lampposts — he designed them. But that doesn't mean you shouldn't spend time lingering at the hotels, restaurants, nightclubs and outdoor cafes that give this plaza a constant buzz. Plaça Reial is one step down from Las Ramblas on the list of Barcelona tourist traps and is only 30 seconds away from it, making it the perfect escape from the hustle of Barcelona's most famous street. Casa Batllo, at Passeig de Gracia 43, is the centerpiece of the Apple of Discord block (manzana is Spanish for both 'block' and 'apple'), sharing foundations with work by two more Modernista architects, Domenech i Montaner and Puig i Cadafalch. Renovated by Gaudi in the first decade of the twentieth century, this is something that Gaudi actually finished! Not only did he add his colourful Modernista touch to the facade, he also did the interior too. Entrance to Casa Batllo is a staggering 20€, though it includes an audio tour; if you visit, be sure to pre-book your entrance online and skip the typically long wait. Further along Passeig de Gracia, on the right hand side this time, is La Pedrera (more formally called Casa Milà, but it is rarely called that today). Less colorful than Casa Batllo, La Pedrera is all undulating concrete and twisted iron balconies. La Pedrera was intended as a residential building and indeed it has been used as that. There is an exhibition of one of these residential spaces. Perhaps the best element of La Pedrera is what you can't see from this picture — the rooftop sculptures and chimneys. Owned by Fundació Catalunya-La Pedrera, La Pedrera hosts art exhibitions and evening concerts. Entrance is around 27 euros for adults. Make reservations online before you visit. Turning right from Passeig de Gracia, walk down Avinguda Diagonal for approximately ten minutes. Looming on your left will be La Sagrada Familia (turn down c/Sardenya to reach it). If the rest of Gaudi's achievements are ever forgotten about (which is unlikely), his legacy will live on in La Sagrada Familia, despite the fact that the basilica is still not finished, more than 80 years after Gaudi's death. Gaudi began the Sagrada Familia project in 1883. When he died in 1926, Domenech Sugranyes continued the work. The Spanish Civil war interrupted building in 1935 and project was further affected by a fire in the crypt and in Gaudi's studio. Work recommenced in 1952. From afar, La Sagrada Familia is a ghoulish behemoth that looks as if it is melting before your eyes. Start your Sagrada Familia experience from across the street and walk around its perimeter, taking in the sheer scale and audacity of the project. The projected spire that they intend on building in the center of the building is expected to be nearly double the height of the present highest spire. Once you have taken in La Sagrada Familia from afar, cross the street and take a closer look. The front and back of the basilica are the most impressive, showing the birth and death of Christ, respectively. A third facade, The Glory Facade, is in progress and will represent the elements of Earth, Wind, Fire and Water. Take the metro from La Sagrada Familia up to Lesseps — Parc Guell is signposted from there. Intended for wealthy families to buy triangular plots of land and have their houses built there (perhaps by Gaudi, perhaps not) the venture never took off and another one of Gaudi's ideas fell by the wayside. 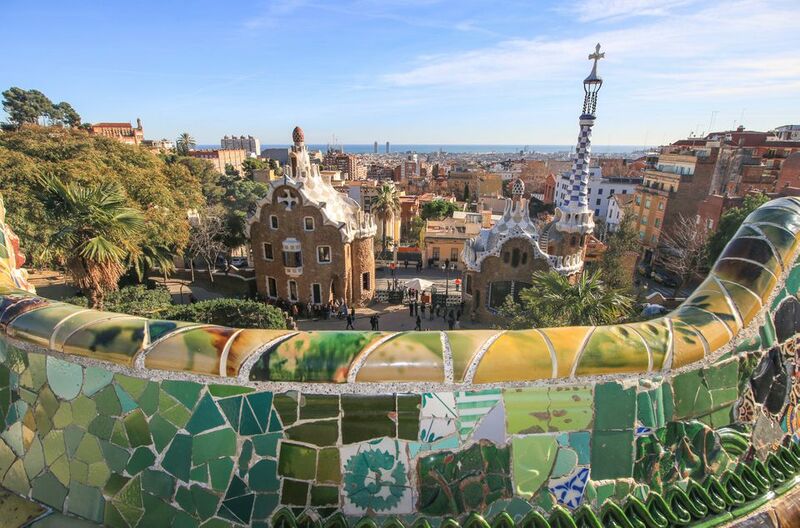 The park's attractions include its serpentine ceramic bench, water fountains and the Hansel-and-Gretel-style houses that Gaudi did manage to finish.